CAR1276 is an exceptional 5-bedroom holiday villa. 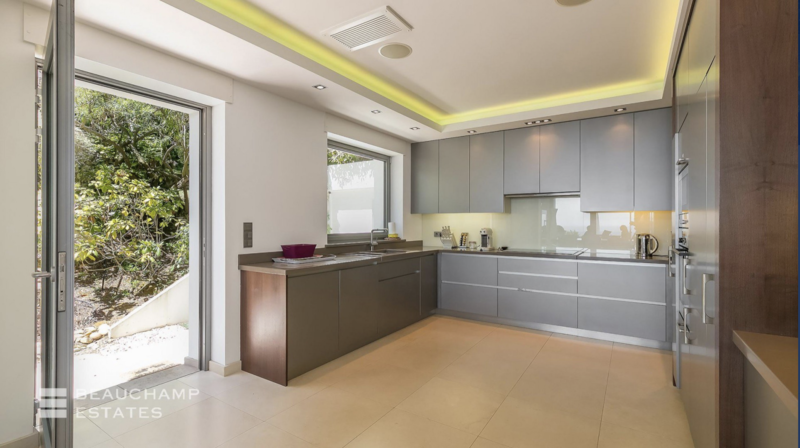 It is ideally located in the exclusive Super Cannes neighbourhood of Cannes. The 300m² property is set in extensive grounds with views overlooking the Mediterranean, as well as the beautiful Iles de Lérins in the Bay below. 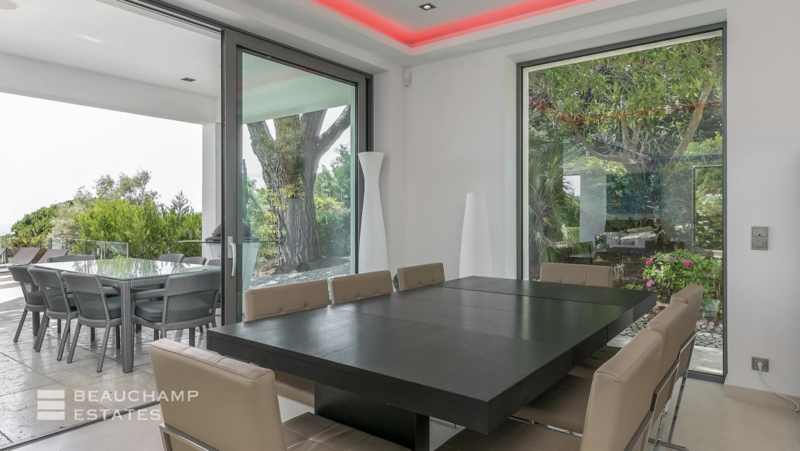 Sleek and modern, the villa can easily accommodate up to 9 guests for a luxurious getaway on the French Riviera. A spacious master suite can be found on the first floor while the ground floor comprises an elegant living room with a dining area as well as a fully equipped modern kitchen. The villa also comes with an independent apartment which can be used for additional guests or as staff quarters during your stay. The house is surrounded by a 2000m² garden whilst the main living space opens out onto a delightful sun deck set around a beautiful infinity pool. There is a covered outdoor dining area which is perfect for al fresco dining and the first floor bedrooms open directly onto another large sunny terrace. 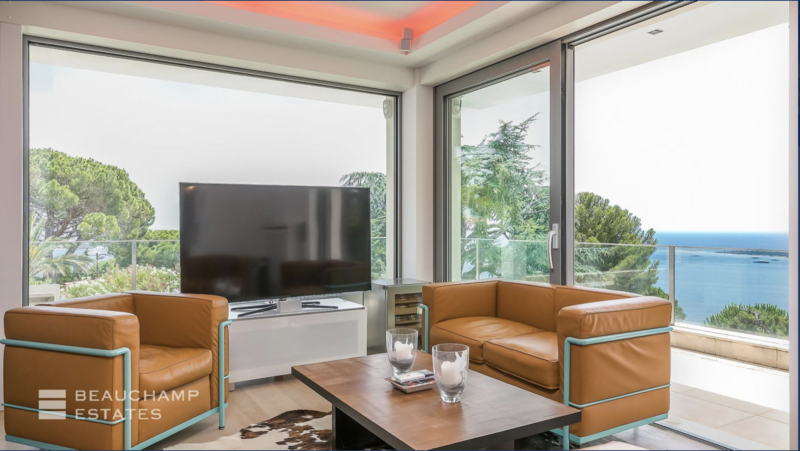 Contemporary and elegant, this beautiful modern villa is an ideal holiday home on the French Riviera. Decorated in chic neutral tones, the villa has been cleverly designed with high-tech recessed ceiling light to set the mood throughout the house. Large glass sliding doors flood the villa with light during the daytime and provide breathtaking views over the Mediterranean below once night falls. The main living space includes a comfortable lounge area plus a stylish dining area for 8 guests with direct access to the sunny terrace. There are 4 generously-sized bedrooms in the main house, plus a separate apartment with an additional double bedroom for complete privacy. The dazzling city of Cannes is just a 10 minutes drive away. The stunning villa is an ideal holiday home on the French Riviera. Why not spend time at one of the chic beach clubs down on the coast, discover Cannes’ amazing restaurant scene or shop til you drop in the designer boutiques along the famous Boulevard de la Croisette. Cannes has something for everybody to enjoy and this gorgeous villa is a fantastic base for an unforgettable holiday in the South of France. The villa’s main living area is a beautiful lounge room on the ground floor. Decorated in crisp white and featuring modern recessed lighting, the living room has 3 comfortable sofas grouped around a coffee table and a large flat-screen television. 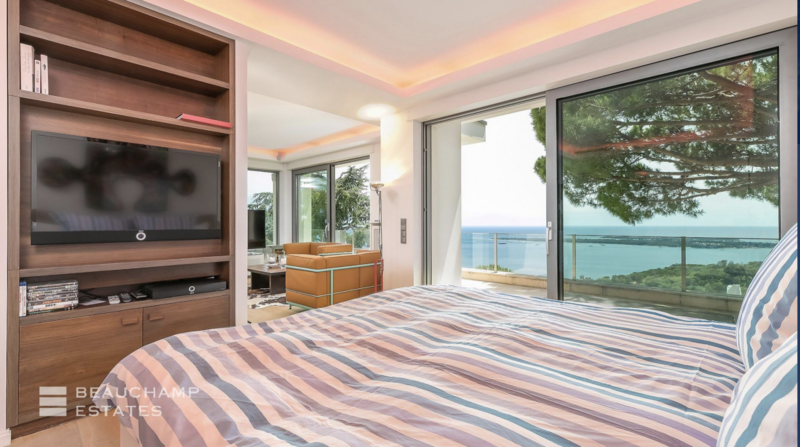 One wall of the room is made up of sliding glass doors which offer breathtaking views over the Mediterranean and the Bay of Cannes and the room features several fabulous pieces of contemporary pop art. Leading directly off the living room is an elegant dining area with space for 8 guests. Open and bright, the dining area has direct access to the terrace and features the same modern recessed lighting as the living room. The villa has a large modern kitchen with stylish wooden cabinetry and chrome fittings and fixtures. A patio door to the terrace allows lots of natural light into the room, while there is ample space for preparing dinner or drinks. The built-in cabinets provide lots of storage space while the recessed ceiling lights give the room a very contemporary feel. There are 4 generously-sized bedrooms in the main house, including a master suite which comes with a private living room, terrace, and a bath and shower room. An additional 5th bedroom can be found in the villa’s independent apartment. All the bedrooms are decorated in calm neutral tones with beautiful wooden floors and feature more of the owner’s fabulous pop art collection. In the main house, 2 of the bedrooms come with ensuite facilities while the remaining 2 rooms share a private bathroom. Cosy and inviting with stunning views over the gardens, the villa’s bedrooms are the perfect place to relax and unwind during your holiday. The villa has 3 bathrooms in the main house, plus an additional shower room in the independent apartment. 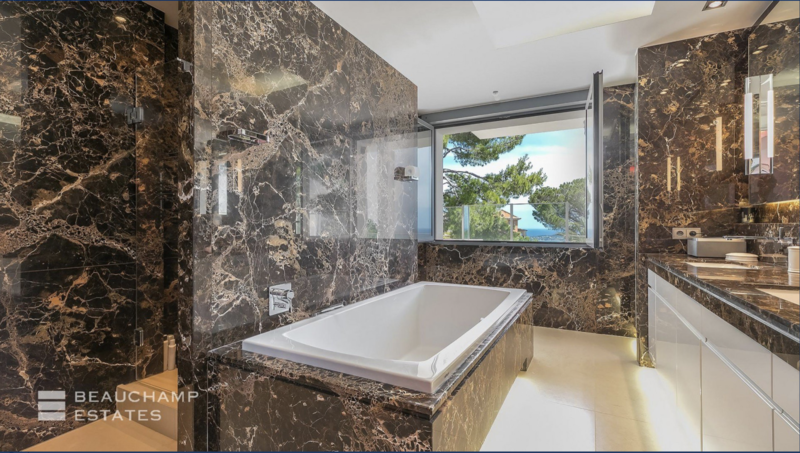 Decorated in sophisticated marble and featuring fabulous full-length bathtubs or walk-in showers, the villa’s luxurious bathrooms are ideal for pampering yourself during your stay. The independent apartment in the grounds of the villa is made up of a living room, kitchen, double bedroom and shower room. Quiet and private, the apartment can be used as guest accommodation or staff quarters during your stay. The villa is set in grounds of 2000m² overlooking the Bay of Cannes and the mysterious Iles de Lérins. Lush green trees surround the house and pool area creating a little haven of tranquility in the heart of this glittering city. The first floor rooms open out onto a sunny terrace overlooking the garden and the pool below. Downstairs, the main living area leads onto a large patio with a covered outdoor dining area for 8 guests. Overlooking the Mediterranean and the gardens, this is a great spot for leisurely lunches or fabulous dinner parties al fresco. The villa is set around a huge infinity pool which has stunning views of the Bay of Cannes. Surrounded by a large sundeck, the pool area is perfect for socialising or soaking up all that French Riviera sunshine. Recline on one of the comfortable loungers around the pool or lie back in the fabulous Balinese style wooden hammock and sip a cocktail, life doesn’t get much better than this. The villa comes with a private garage plus parking in the grounds for complete peace of mind during your stay.